Officers want to speak to a man caught on CCTV in connection with an attempted robbery in Northampton town centre. The suspect brought a mobile phone into repair at the BV Tech shop in the Drapery, but when he was told he needed to buy a new charging cable, he grabbed hold of the cable and tried to leave without paying. The shopkeeper then took hold of the offender and the charging cable in an attempt to detain him, but the suspect broke the cable before threatening the shopkeeper and leaving. 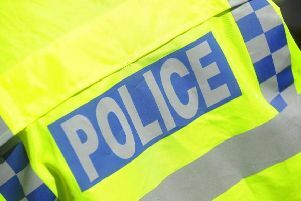 The incident happened on Saturday, March 4, sometime between 12.25pm and 12.35pm, Northamptonshire Police today revealed. The suspect is described as black, aged in his early twenties and about 5ft 10in with a slim build. He was clean shaven and wearing a black baseball cap with a white design and a blue fleece jumper, grey jogging bottoms and black trainers. He was carrying a shopping bag. The offender was in the company of another male who was not involved in the offence. He was also black, aged in his late teens or early 20s, 5ft 9in with a slim build. He had a "flat top" hairstyle and was clean shaven. He wore a black jacket, grey t-shirt, grey trousers and black trainers with white laces.